Vance D. Wyatt, was raised in North Chicago, Illinois. A second generation graduate of North Chicago High School, Vance was very involved in the school’s academic clubs and athletics. He was a member of the boys tennis team, the Academy of Finance, the Abbott-sponsored Computer Science Explore Post, and the National Honor Society. Vance was named Business Student of the Year and received the John Cunnea Business Scholarship from Matthews Employment Services as well as the Waukegan Township Scholarship in 2008. 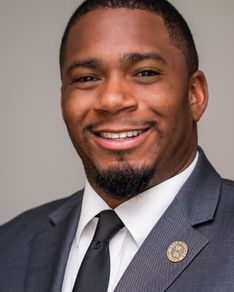 Before later earning his bachelor of science in business management with a minor in public policy from National-Louis University, Vance took a hiatus from his schooling to run for alderman of North Chicago’s 4th ward. Although he gracefully lost in the primary to the incumbent, the young aspiring public servant’s persistence caught the eye of the North Chicago mayor who appointed him as a Trustee of the North Chicago Public Library. Only 20 years-old at the time of his swearing in, Vance became the country’s youngest library trustee. Later, he was appointed to the Illinois Library Association Public Policy Committee where he served for three terms. Other accomplishments here include helped in securing a $3 million dollar remodel at no cost to taxpayers, updating operating systems and technology, and working to make the library more accessible to residents by adding additional stops to the bookmobile, eliminating unnecessary fees, and partnering with the local park district to strategically plan programs and events. In 2012, Vance became a Democratic Committeeman, a post which he was reelected to in 2014 and 2016. In 2014, he was also selected by his fellow committeeman to serve as Chairman of the Shields Township Democratic Party. In April 2018, he was elected to serve as 4th Vice -Chairman of the Lake County Democratic Party. In April of 2015, Vance was elected to serve as commissioner of Foss Park District. During his tenure as Park Commissioner, he was elected as vice-president in 2015, president in 2016 and re-elected president in 2017. At the park district, Vance worked to rebuild trust in the institution, put much needed bylaws and ordinances in place to govern the park board, worked on a beach restoration project with army corp engineers, and offered scholarships to local youth. In 2017, following the passing of long-standing and well regarded county board member Ms. Audrey Nixon, Vance Wyatt was nominated by the County Board Chairman to serve as a Lake County Board Member and Forest Preserve Commissioner for District 14. He sat on the county’s committees for Government Reform Implementation Committee (Vice-Chairman), Ethics and Oversight, Diversity and Inclusion, Public Building Commission (Vice-Chairman) and Law and Judicial as well as the Forest Preserve’s Operations and Rules committee. Vance is eager to continue in the legacy of Ms. Nixon, by putting the people of Lake County, and District 14 first. After losing the Democratic Primary in March 2018; he left the County Board in November 2018. In April 2019, Vance ran for the Foss Park Board again and was elected in a three way race with 48% of the vote. As a County Board Member, Vance pushed for increasing youth opportunities, reducing homelessness, recidivism, unemployment and underemployment, and promoting economic development and a living wage. During his tenure he was able to acquire over 50 million dollars for his district along with pushed for Redistricting reform and helped approved the framework for the 2020 redistricting advisory committee. Vance has been a recipient of the Waukegan Township “Drum Major” award, the Illinois Association of Park Districts’ Distinct Board Member recognition and Master Board member recognition. When not serving his beloved Lake County, Vance works as a financial analyst for CVS Health. He also holds a master’s of business administration with a concentration in banking and financial institutions from Concordia University Chicago.